Kick A Rock: I Drink and I Know Things: Game of Thrones Sn 6, Ep 8 – "No One"
Ep 8 – "No One"
Some plot lines are resolved, many are not. Once again we are given an episode that moves the chess pieces around (some quicker than others) to set up the final two episodes of the season. The show has been slow burning a few of these stories and I do believe the payoff will be worth it when all is said and done. We'll talk more on that later, but for now let's start with no one in Braavos. A few stitches, some chicken soup, and a little milk of the poppy are all Arya needs to mend her wounds. It looked like she was stabbed one too many times to make such a speedy recovery, but when an experienced man shanker like Lady Crane is around I suppose anything is possible. Unfortunately for the acclaimed actress her final curtain call came in the form of the Waif (Faceless Girl) and a gruesome "death by step stool." A foot chase ensues that looked like something out of a Bourne/Bond film and involves Arya knocking over all of the orange baskets in the city. Seriously, there were more oranges on those stairs than there are in the entire "Godfather" trilogy. All citrus aside, the ending of this sequence was perfect. 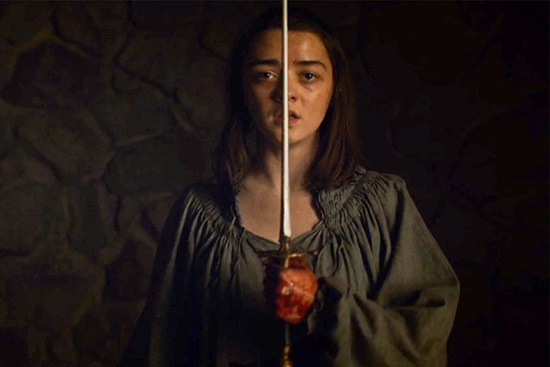 The Waif is baited into Arya's dark alleyway and comes face to face (see what I did there) with Needle. Another face has been added to the hall and Jaqen H'ghar seemed content to let Arya Stark of Winterfell begin her quest back home to Westeros. Hopefully he finds a new servant soon because those faces aren't going to cut themselves. The Hound puts his skillful wood chopping abilities to use on the Brotherhood without Banners and takes out four of them in a matter of seconds. He catches up with the remaining stragglers a little too late as the Brotherhood led by Beric Dondarrion and Thoros of Myr already have their defectors strung up and ready for a hanging. After much negotiating, The Hound is given the honor of taking out 2 of the 3 men which he considers a win (although he would have preferred a more brutal ending for them). The Brotherhood's plan to head north to fight the undead and presumably the White Walkers is revealed and they attempt to recruit Sandor to their cause. The Hound fighting a horde of zombies with an axe? Yes. All of that please. Speaking of the Clegane family, The Mountain gets unleashed in King's Landing when Cersei chooses violence! Well, sort of unleashed. 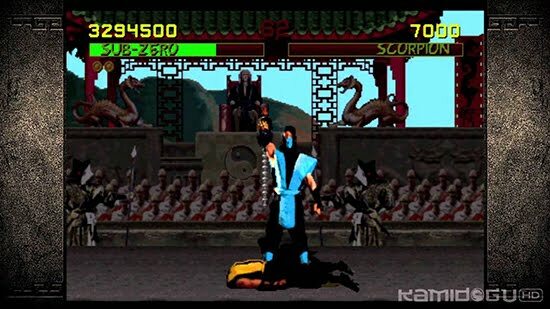 He gets to bust out his best Sub-Zero impression and takes out one of the Faith Militant anyway. (It's been eight episodes, you knew a video game reference was coming from me sooner or later.) Tommen continues to play into the High Sparrow's hand and forbids a Trial by Combat from happening ever again. Our "king" is beginning to annoy me. One of our readers, Ryan Purdy, wrote in this morning with a very interesting theory about the fate of Cersei and King's Landing. Maester Qyburn was looking into something for her that turned out to be "much more than rumors." Ryan is guessing that this is a stash of the remaining wildfire buried underneath the streets of the city. (I think he's spot on with this theory. Thanks for writing in!) This season has hinted at Cersei snapping and burning the city to the ground and she may be doing that before she even has a chance to go to trial. I'm in 100% agreement of this theory and I think we will see a "Mad Queen" Cersei before this is over. If history repeats itself, we may see the emergence of a "Queenslayer" as well. Riverrun was overrun. Kind of... I guess... In any event the show seemed to streamline this part of the story in order to free up the characters involved for, hopefully, bigger and better things. I did enjoy the scenes between Jaime and Brienne, Jaime and Edmure, and especially Pod and Bronn. I really would have loved to see some sort of a siege happen here though. Instead the Blackfish defended his castle until the end (which was sadly done off screen) and the Lannisters and Freys reacquired it from House Tully. Riverrun gets an "A" for dialogue, but an "F" for sieges. It still passes overall. I'm glad it's over. I'm sorry, but why is Varys leaving Meereen? The most famous dwarf in the world needs a companion to talk to other than Grey Worm and Missandei. Tyrion tries to joke around with them and get them to unwind again and it's alright, but we've seen it before. I love Tyrion. He's my favorite character by far. He needs more to do this season. If he winds up taming some dragons by the end then this whole Meereen story will be worth it. Hopefully Dany arriving means that the Slave Masters' fleet will be quickly destroyed (possibly with some help from the Greyjoys) and we can leave Meereen forever. Is Tyrion ever going to finish his "I once walked into a brothel with a honeycomb and a jackass" joke? I know he's not technically on her list, but I would love for Arya's first stop in Westeros to be at the Twins to visit Walder Frey. Varys leaves Meereen just before it gets attacked? Convenient? That would be a nasty twist. I hope it's not. Haven't seen Dorne in a while. I'm not sure if that means anything, but speculate all you like. My money is on Littlefinger showing up in the eleventh hour to save the day during the battle of Winterfell. Speaking of which, next week's episode is called "The Battle of the Bastards" and judging from the preview (below) we will be getting a single location based episode like Blackwater, The Watchers on the Wall, and Hardhome. These "epic battle" episodes have been some of my favorite in the series. Let's get hyped! It also looks like Davos finds out what happened to Princess Shireen. Run Red Woman! Run! As usual, thank you for reading and let me know your thoughts and theories in the comments. We should have a lot to talk about with the last two episodes of the season ahead of us.